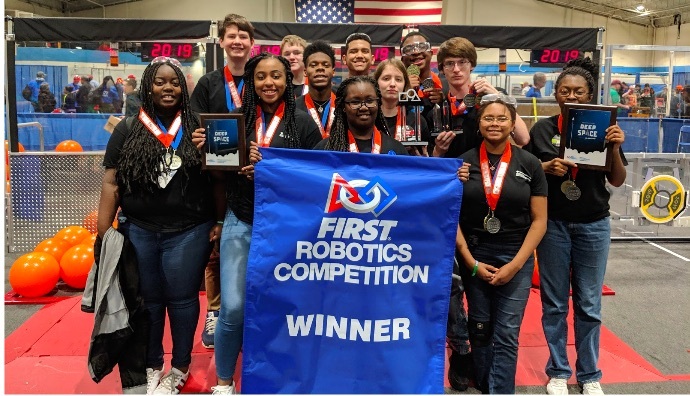 The Commodore Conyers College and Career Academy (4C Academy) robotics team, The Commodores, is preparing for the 2019 FIRST Championship to be held at the George R. Brown Convention Center in Houston, Texas next week, April 17th-20th. This world-level qualification follows the team’s exceptional 2019 competition season in which The Commodores garnered an overall 9th place finish out of 87 Georgia-based teams. Founded in 1989, FIRST is a not-for-profit designed to inspire young people’s interest in participation in science and technology, and to motivate them to pursue education and career opportunities in STEM fields. Each year, robotics teams from across the globe compete for the opportunity to qualify for the FIRST Championship game. This year’s theme, Destination; Deep Space, challenged participating teams to build robots capable of carrying “cargo”, and climbing back on their “spaceships”. Chris Hatcher, 4C Academy CEO, also commented on the announcement, “I am very proud of our robotics team members – they have worked incredibly hard this year! It is very challenging for any team to earn a spot to the World competition and represent the state of Georgia, especially as a 2nd-year team. It’s a huge accomplishment.